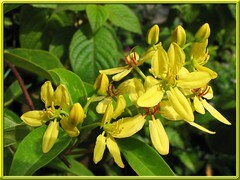 An attractive ornamental liana that is widely grown for its beautiful and showy trusses of bright yellow flowers. Mostly cultivated in the tropics or sub-tropics to lend beauty to the landscape. Its rampant and vigorous growth make it ideal for trellises, arches and pillars at porches, or as a hedge on fences, and even espaliered on walls. Features: Tristellateia australasiae is one of the approximately 30 species of woody vines of the genus, Tristellateia. Growing vigorously with a liana habit, this climber can reach 10 meters tall or more. Its viny stems are purplish grey in colour, covered with lenticels, rough to the touch. 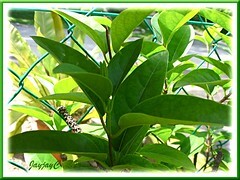 Fresh green foliage with leaf blades measuring 5-12 cm long, are arranged in opposites along the twining branches. These short-petioled (1-1.5 cm long) evergreen leaves are ovate to lance-shaped, simple and have slightly recurved margin. Leaves are glossy, smooth and leathery, and surfaces marked with tiny glands. 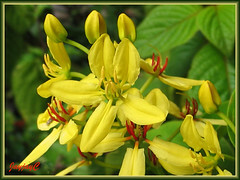 It produces numerous clusters of golden yellow flowers continuously through the year. Each short axillary and terminal racemose inflorescence typically bears between 18-30 flowers. Hence, given besides others, these two common names, Shower of Gold Climber and Australian Golden Vine which best describes its bountiful floral display. Each bright yellow star-shaped flower, 2-3 cm across, has five-stalked elliptic petals (8-15mm long x 5-6mm wide) and about ten scarlet-red stamens in fabulous contrast. Fruit is a 3-parted winged-capsule. There’s another plant, Galphimia gracilis/glauca (Shower of Gold) that resembles T. australasiae very closely, but the former is distinguishable by its shrubby habit while the latter is a tropical vine with a liana growth habit. Culture (Care): Tristellateia australasiae (Vining Milkweed/Thriallis or Galphimia Vine) is a relatively fuss-free vine, easy to care for and flowers generously through the year. Light: Best growth and blooming in full to partial sun. Soil: Grows best in fertile, moist and well-drained soils. Others: Prune regularly to maintain bushiness and encourage flowering with more branching. Can tolerate hard pruning too when vine becomes top heavy. Fertilize once monthly with a balance liquid fertilizer. Relatively free from pests and diseases. Propagation: Easily propagated by cuttings or seeds. Usage: Tristellateia australasiae is excellent for decorating trellises, arbors, arches and porches. 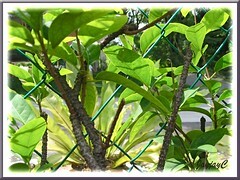 An ideal landscape vine that can be grown on ground or containers. Suitable too as an ornamental covering on garden fences or espaliered on walls. An attractant for butterflies, bees and hummingbirds as well. I really admire this vine plant. They constantly send out blooms and have a bright contrast of yellow and red. I guess the seeds are in starshaped disc? There is one thing though – We do not have hummingbirds in Malaysia, rather sunbirds which do not flap its wings rather grips at the flower stalk for the nectar. I had checked and rechecked over and over again for details on humming birds in Malaysia but found none. Hope you would enlighten me about the details. Dear James…if you had read my response carefully, I did not disagree that there are no hummingbirds in Malaysia. Just clarified that the yellow-breasted sunbirds that I’ve observed in our garden, do flap their wings like the hummers. Check at Wikipedia for details on sunbirds. wow beautiful bloom and never seen before. I am sure it will also suit to my climate. Thanks! Indeed, they’re stunning and love tropical heat, light and humidity.